VM Pérez-Martínez, MD Rodríguez González, M Tobajas Gracia (2017): “Mobilization and political participation on Twitter. Case study of the hashtag #SuperTuesday in the primaries of the presidential elections of the United States 2016”. Revista Latina de Comunicación Social, 72, pp. 679 to 703. Introduction: the election process of the United States is of interest worldwide; it is an impactful event due to the informative interest and the Super Tuesday is a milestone in the electoral campaign of the White House. Objective: Analyse contents and interaction in Twitter during the Super Tuesday. Methodology: The study included the characteristics of Tweets published, types of contents, themes and interaction in Twitter. The study was carried out by selecting tweets during Super Tuesday event that included the #SuperTuesday hashtag. The methodology used was contents analysis. Discussion and Conclusions: The constant was the preference for highlighting the election day through original contents and in which none of the candidates were remarked. Super Tuesday was the preferred issue making place to candidates, at the end of the day, as preferred theme. Primary elections; Super Tuesday; Electoral Campaign 2016; Social networks; Influencers; Twitter. 1. Introduction. 1.1. Context of elections 2016 in the United States. 1.2. Twitter and elections. 2. Methods. 2.1. Categories and Variables. 2.2. Sample. 3. Results. 3.1. Mobilization and Participation. 3.2. Influencers, themes and subthemes in the Super Tuesday. 4. Conclusions. 5. References. United States elections are a milestone in the history of election processes; due to the relevance of the election for President of one of the countries with most political, military, economic and social influence of the world and, in the context of this research, because it is a promising study object where Communication researchers and of other areas of knowledge focus their attention on, as evidenced in studies published from different approaches: empirical, qualitative or mixed (Gutsche et al, 2014; Klar, 2014; Smidt, 2014; Prior, 2012). It is a theme of interest as well in other countries where the academic community analyses these electoral processes from interdisciplinary approaches (Ruiz, 2012; Valdez Zepeda and Huerta Franco, 2009; Rodríguez Pestano, 2003; Kennamer, 1995). Whenever there is reference to the use of information and communication technologies in the United States Electoral Campaigns there are always novelties and interest (Hunter, Lewis, and Overton, 2013; Peña-Jiménez, 2011; Serfaty, 2012; Bimber, 2003; Denton, 2002; Sabato, 2002) being the elections of 2008, and the campaign performed by the Barack Obama team, another remarkable milestone in the integration of Internet in the electoral match (Macnamara and Kenning, 2014; Winneg, 2011; González, 2010; Pérez-Martínez, 2009). Weeks and Southwell (2010) state: “Not only has American Internet use increased, but the reasons for which the public turns to the Internet also have evolved such that people of voting age now tend to use the Internet as a tool for information searches and turn to search engines to find that information" (p. 343). The electoral process in the United States, worshiped by some and questioned by others (Bugh, 2010), is carried out in stages -among them, the primary elections (Harmon, 2004; Gurian, 1993)- and with characteristics that grant journalistic interest not only in the United States but at international level as well. It is an indirect polling system (conceived in the defence of interests of small States) where the Electoral College (538 delegates or electors) is the one choosing the president (the majority needed to be elected President is 270 votes). According to Fortier (2008), the authors of the Constitution of the United States “where concerned that a president chosen by the Congress tried to win over this electing institution, which will end up becoming a simple puppet of the legislative branch, instead of being an independent voice” (p. 8). The Electoral College has a representation by each State depending on its population. The citizen votes (Election Day) for the voters that will comprise the Electoral College and these will vote for the President and the Vice-president of the United States. In this process, political parties have a leading role so that citizens can choose their voters based on the candidates they present for the Presidency and Vice-presidency; these are assigned in national conventions held by political parties. The national conventions of the Democratic Party and the Republican Party constitute the event where the candidates are officially designated by every political party; however, in the way there are other candidates that have tried to gain the consent of their voters. The delegates that must make the candidates of every political party official are elected in the States through primary elections and several States use the “citizen assemblies” (caucus) in their jurisdictions: “Public forum in which registered voters gather to decide which presidential candidate will be supported by party delegates from their precinct” (Becker et al, 2009). In this process, the figures of presidential candidates gain relevance and try to capitalize the interest of their activists to be designated in the national convention of their political parties as the official candidate for presidency. The Super Tuesday is a key event in the pathway towards presidential elections (Becker et al, 2009; Tewksbury, 2006) because it is one of the first moments of the process where primary elections or caucus identify who will be the candidates with greater options to be designated in national conventions of their political parties as candidates for presidency. The particularity of the Super Tuesday is that it is a day where there participate a considerable number of States and with a significant representation in the Electoral College. In the year 2016, the State of Iowa started the primary elections and it continued with New Hampshire; afterwards: Nevada and South Carolina. It was in the Super Tuesday (March 1, 2016) when the political party activists were called for voting and the following States were involved: Alabama, Alaska, Arkansas, Colorado, Georgia, Massachusetts, Minnesota, Oklahoma, Tennessee, Texas, Vermont and Virginia. The machinery of political parties tried, on Super Tuesday, to identify the trend of the electorate -what will be its favorite candidate- to reorganize or reinforce the strategy of the candidates’ electoral campaign in their political party, depending on the case. In 2016, political parties assumed complex primary elections, keeping this peculiarity during the whole electoral process until presidential election; mainly, due to the style of the discourse conveyed by Donald Trump (Ruthizer et al, 2017; Anguiano, 2016; Hogan, 2016; McAlister, 2016; Powell, 2016; Wilz, 2016). The Republican Party arrived at Super Tuesday with an internal electoral dispute of four candidates: Donald Trump, Ted Cruz, Marco Rubio and John Kasich. The Democratic Party with two candidates: Hillary Clinton and Bernie Sanders. In each political party, there happened circumstances that finally ended with the designation of two candidates for presidential elections: Donald Trump (Republican Party) and Hillary Clinton (Democratic Party). Ending with the election of Donald Trump as the 45º President of the United States (since January 20, 2017). A greater pathway, and professionally better integrated in politics, keeps Internet as main channel of political communication in electoral processes, either in the United States or in other countries (Marcos-García, 2017; Ahmed et al, 2016; Graham et al, 2016; López-García, 2016; Quevedo Redondo et al, 2016; Larsson and Ihlen, 2015; Pérez González, 2015). Traditional communication media (press, radio, television), are still relevant in electoral processes; but with Internet, options for citizen and the way of interacting in the political-electoral theme have originated other consumption platforms and study possibilities: “Television audience measurement can track the size and composition of program audiences, but it can say little about the news topics or stories that attract viewer attention. Internet audience measures taken at the level shown here can be much more precise in their assessment of audience attention to specific topics” (Tewksbury, 2006, p. 327). Moreover, some perceptions about the fact that web spaces could interfere with rumours in electoral campaigns, do not seem to have any foundation. For example, the approach in the presidential campaign of 2008 was focused on emails; not specifically in the media, but instead in “the social dynamics that drive how people use e-mail” (Kelly Garrett, 2011, p. 270). The following approach was to extrapolate whether this social dynamic could maintain in social networks: “The influence of this dynamic on rumouring appears to be modest to date, but as online social media become more pervasive, the harmful consequences for public understanding of important political issues may pose significant challenges to the democratic process” (Kelly Garrett, 2011, p. 270). More and more, the percentage of audiences that consume contents from different platforms increase, leaving behind the usual form of getting political information or of any other kind: “Twitter increasingly performs the agenda-setting function in politics once dominated by television. Television or, at least, televised news now follows the lead of Twitter” (Ott, 2017). Twitter, as microblogging platform and by its narrative and interactive structure, facilitates communications among its users. It is a social network characterized by its simplicity in the creation of contents: “A Tweet may be clever or witty, but it cannot be complex” (Ott, 2017). It has a collaborative structure, incorporation of multimedia contents, open and conceived “in mobility concepts” (Blanco and Sueiro, 2014). The difference from other social networks such as Facebook, which is understood as a “private” (person-to-person) or “semiprivate” network (Vargo et al, 2014), is that Twitter is assumed as an open network where the user stablishes the privacy. Besides, as Vargo states “Twitter provides the opportunity to perform one analysis covering both people and media”. Currently, Twitter is a platform integrated in the political communication strategies (Bosch, 2017; Martínez-Rolán and Piñeiro-Otero, 2016; Rauchfleisch and Metag, 2016; Ruiz del Olmo and Bustos Díaz, 2016; Theocharis et al, 2016), in electoral campaigns (Jungherr and Schoen, 2016; Lemke and Chala, 2016; McKinnon et al, 2016; Penney, 2016) and, in the context of the United States (Vargo et al, 2014), it is a channel of communication and interaction with activists of political parties and with citizens who use this social network as a channel to get information and generate interaction with other users. In the electoral campaign of 2016 Twitter was integrated in a more efficacious and efficient manner in the communication strategies of the political parties and the candidates themselves (Lee y Lim, 2016). It seems, that mass media could focus in key moments of the day while users, either fond of candidates or not, could have real time data about the electoral activities. In this context, the professionality of communication managed from the Hillary Clinton account, perhaps with a more stereotyped image (López-Hermida and Fernanda Vallejo, 2016), contrasted with the more straightforward style of Donald Trump (Gunn, 2017); although this apparent “informality” could have positively reinforced his image among voters: “His mastery of conventional and digital media—hybrid campaigning—helped drive his coverage to the nomination” (Wells et al, 2016, p. 675). It is feasible that Donald Trump’s style fitted in the Twitter’s structure of contents’ elaboration: “Trump’s ordinary speech reflects the underlying logic of Twitter” (Ott, 2017). To what extent the information that provides data generated on social networks, such as Twitter, allows predicting who will be the winner in an electoral dispute? This prediction capacity of social networks such as Twitter is still to be the determined (Penney, 2016). Murthy (2015), in a study carried out about the use of Twitter in primary elections in the United States of 2012 is mentioned that: “Twitter is not predictive of offline vote outcomes” and adds “in other words, the tweets served more as a positive marketing tool as part of a campaign strategy, but did not make up for shortcomings in other parts of their campaigns”. So, we still need to evaluate whether there are variables that could turn social networks such as Twitter, into a more efficacious space to predict what happens outside of social networks or their impact in the vote intention; of course, considering other variables that can determine results: the progress of technology, the increase of individuals using social networks such as Twitter and that every electoral process, in itself, is different with its specific communication strategies and segmented by political parties and candidates. New actors strictly linked to communication on social networks arise. The concept of influencers is gaining more and more relevance in the framework of political communication (Puyosa, 2016; Carew, 2014). This figure, as Bakshy and others say (2011) is still ambiguous in the context of social networks: “In general, influencers are loosely defined as individuals who disproportionately impact the spread of information or some related behaviour of interest”. In specific, who can considerate himself an influencer? : “Ordinary individuals communicating with their friends, for example, may be considered influencers, but so may subject matter experts, journalists, and other semi-public figures, as may highly visible public figures like media representatives, celebrities, and government officials”. On the other hand, in the other extreme of communication, social networks like Twitter potentially enable the citizen to get in contact with candidates’ activities, their words or their actions in front of the impossibility of being present in electoral events. From the candidate’s vision, it provides a channel to expose their ideas and details of their political-electoral program to the voter (Johnson, 2012). It is even feasible to evaluate, that the configuration of the agenda-setting in this new media context requires new theorethical models of analysis: “The rapidly changing mediascape requires new theories, models, and concepts” (Guo and Vargo, 2015, p. 574). The leadership, in politics as in other fields (López-García, 2016), entails new unwaivable scenarios: “It can be stated that digital leadership can be achieved not only reproducing the characteristics of offline leadership, but also by observing rules imposed by new technology” (Narbona, 2016, p. 94). In the framework of the electoral process of the United States of 2016, the objective was to analyse contents published and the interaction that took place in Twitter during Super Tuesday (March 1, 2016). The unit of analysis was established following these criteria: contents published in Twitter whereas this hashtag was present: #SuperTuesday. The use of the hashtag as searching criteria, has been used and corroborated in other researches (McAlister, 2016; McKinnon et al, 2016; Caleffi, 2015; Cozma and Chen, 2013; Burgess and Bruns, 2012; Bruns and Burgess, 2012; Papacharissi and De Fátima Oliveira, 2012). The author of the tweet that incorporates a hashtag has the intention of visualizing its contents in the social network; these messages can be recovered and integrate a list of contents organized with said hashtag. They are “keywords that allow organizing a great amount of contents shared in Twitter every day” (Moreno, 2014, p. 112). A first approach included the study of Twitter accounts and tweets with a greater relevance during the day. It would correspond to quantitative data comprised in the selection criteria of Twitter and tweets, being data of interest to obtain details about the behaviours of users during that day. In that same line, our first research question (P1) was: Which were the characteristics of tweets published during Super Tuesday event? The second approach was about candidates elected by the Democratic Party (Hillary Clinton) and the Republican Party (Donald Trump), when the primary elections ended. It was a retrospective vision of these candidates with greater options for presidency of the United States. We set forth the second research question (P2): which were the characteristics of the tweets published during Super Tuesday about candidates Donald Trump and Hillary Clinton? Finally, and assuming that Twitter contents would be more extensive, we agreed a third research question (P3) that would help us value the relevance of the use of Twitter in the Super Tuesday: analyse the use of Twitter users during Super Tuesday event? The elements to be valued in tweets were: identification data, tweets elements, themes and sub-themes, the political positioning, hyperlink characteristics and images. Tweets identification data: a) publication date; b) publication time; c) username of the Twitter account; d) nickname with which the user identifies itself on Twitter (always preceded by '@'); e) biography (bio) provided by the creator of the account; f) country; g) place of the account, city or location; h) profile of the account (see table 1). Note. The variables explained show an outlook of the characteristics of the sender of Twitter messages. However, it is feasible to consider, that some accounts do not provide data that allow to verify exactly the characteristics of said sender. Source: author’s own creation. Tweet elements: a) tweet published in Twitter; b) format: general characteristics of the tweet (see table 2); c) favourites: number of favourites obtained; d) retweets: number of retweets done to the tweet; e) favourites plus retweets: sum of favourites and retweets. Quotes. Refers to an idea, phrase or contents of another author. They are written between quotation marks or the source is indicated. Retweets are included. Abbreviation. The tweet is written by hashtag or specific Twitter signs in an abbreviated manner. Terms in code (non-decipherable). Graphic codes, initials or text that does not allow to clearly identify the meaning of contents. Spam or advertisement. Advertisement, promotional or self-promotional messages of products or services. Those oriented for the diffusion of events or activities linked with the Super Tuesday are excluded. Journalistic. Informative contents published in Twitter accounts belonging to social mass media. Not identified. It is a kind of tweet that cannot be classified. There is no relationship with the research subject. Hyperlinks are not active. Not available in Internet. The message has been eliminated. Theme of tweets: there were two subcategories (see table 3): a) Main themes of tweets; b) subtheme of tweets. Table 3. Main themes and subthemes of tweet. Multimedia and interactive elements: a) hyperlink and links to: another tweet, journalistic articles, surveys, animated files (.gif), images, videos, web; b) TV screenshots, Twitter screenshots, cartoons, graphic composition, photograph, photograph (with text), photograph (mass media, hosts), photograph (voters), photograph resource, graphs, metaphorical image, meme, text (an image with text). Regarding themes of images, there were some directly related to the electoral process (see table 5). Criteria to recover tweets. Tweets were the #SuperTuesday hashtag is present. Tweets tracking before and after Super Tuesday. Date of tweet recovery: May 24, 2016 (19:33 in the Spanish peninsula). This time margin was considered to recover tweets and favourites. Recovery of tweets was done through the Followthehasgtag platform (http://www.followthehashtag.com/). Selection of tweets. The ones published between 20:30 of February 29, 2016 and 4:30 of March 2, 2016. It was stablished randomly four hours and half before the start of March 1, 2016 and four and a half after 23:59 that same day. We used the Spanish time zone; afterwards, in the process of analysis of results, the adaptation to the United States time zone would be done . Total of tweets recovered: 179.541. Discard duplicated tweets: those where the sender (nickname) and Tweets contents coincided. 302 tweets were discarded (N = 179.239). Tweet retweets were discarded (166.344) and the analysis of original tweets was done (N = 12.895). We excluded tweets between 0 and 10 impacts on social network; considering the number of favourites (Fav) and retweets (RT) (Fav + RT = < 10). Selected tweets: 2.362 tweets. Q3 was identified from the sum of favourites and retweets of every tweet (Q3 = 71). The tweets were the sum was equal or less than Q3 were excluded. Total of tweets: 595 tweets (N = 595). In the process of tweets review, we identified those tweets that were not valid for study (5.7%), establishing the definitive sample in 561 tweets (N = 561). Activity, mobilization and the way of participating in Twitter in a process such as Super Tuesday is settled on the characteristics of the accounts (follower y following), in generated tweets (hyperlinks, types of images, characteristics of texts) and the interaction carried out with other tweets and users (retweets and favourites). The mobilization and participation was developed during a day where messages and contents had an intentionality that was recorded when using the hashtag: #SuperTuesday. The sample of this research, comprised by 561 tweets, were originated from 354 Tweeter accounts (34% are authenticated by Twitter). The relevance of tweets (favourites + retweets) was 224.895: favourites, 129.060; retweets, 95.835. The potential impact of tweets published was 427.618.619 considering account followers and, the reach, was6.779.483 by the following of the account that published tweets. Regarding the frequency of the publication of tweets from a total of 354 accounts, 346 accounts (97.7%) published between one and five tweets; five of them (1.4%) published between six and eleven tweets; three accounts (0.8%) published more than 11 tweets. 23.1% of tweets were published from 14 accounts; the rest of tweets was published in accounts with a frequency of publication below five tweets (76.9%). The greater concentration of the number of tweets published in specific Twitter accounts reflected the relevance of some accounts that were a source of important information for Twitter users when generating a greater number of conversation threads or exchange in this social network about Super Tuesday. Considering the account profile (see table 6) the greatest activity is originated in personal accounts (32.6%) and, immediately following, accounts related to politics (31.9%); accounts of social mass media in third place (23.9%). These data show that personal accounts (linked to politics or not) and Twitter accounts of the political sector set the themes with more frequency on Super Tuesday. It was understandable that mass media had an active participation in the generation of contents and interaction in the social network due to the transcendence of the event. Table 6. Accounts with the greatest number of publication frequencies of tweets, account type and its position. Student Government President of Perimeter College – Georgia State University. Member of Hillary for America's Georgia Leadership Council. Views are my own. Join our campaign for president at https://t.co/nuBuflGIwb. Tweets by staff. The official Twitter page of FOX Business Network: Capitalism lives here. Ask your cable provider for FOX Business in your neighborhood. On your TV and online every morning and in your Twitter feed all day and night. Tweets by @JeffDLowe, @THETonyMorrison, @sswinkgma and @adrianampratt. Make tea not war! We're a compassionate activist #tea biz. Pls follow us to help aid humans, save #animals and conserves our #earth y #environment. We follow back! Note. We identified, among the accounts with a greater number of published tweets, a preference for two the candidates of the Republican Party (6 out of 14) compared to the two candidates of the Democratic Party (3 out of 14). Source: authors’ own creation. It was predictable that Twitter accounts about politics were the ones generating more tweets about candidates (see graph 1), as was the case of Donald Trump, Marcos Rubio and Bernie Sanders. However, it is worth mentioning that in the case of Hillary Clinton, accounts that were different from those of political parties were the ones publishing more tweets; they were relevant from the perspective of quantitative data because they were obtained during the Tweets recovery process following the statistical criteria used to get the sample. The interest to identify influencers in social networks is noteworthy; it is a key task in political communication developed in Internet. Regarding country, 249 Twitter accounts indicated it: 55.6% of 354. Although this data can be modified by the creator of the profile in Twitter, we used the data published on accounts. The considerable presence of the United States was predictable (63.5%) followed by Great Britain (26.9%). The 9.6% that followed are accounts distributed between Canada (4.4%); Australia (1.2%); France, Lebanon and Qatar coincide each one in the percentage of tweets (0.8); the same as: Colombia, Germany, Spain and Zambia which also coincide in the number of tweets (0.4%). United States (due to being the place of Super Tuesday) and Great Britain (due to the use of English as language and the interest towards Super Tuesday) were the two main focuses for tweets issuance. The presence of accounts from Canada was not significant if we consider it is a country that limits with United States and which its politics affect it directly. A similar situation is the case of Mexico which was absent among accounts generating a greater number of relevant tweets. Followers and followings contextualized the impact of these accounts in Twitter and, on the other hand, the “level of engagement and amplification of the message” (Meso Ayerdi et al, p. 168). There are global data of followers that reflect the relevance of accounts regarding this variable:  = 624.468; Me = 28.298. So, the reorganization in range of data indicated by Twitter accounts according to followers (see table 7), indicate that the greater percentage of accounts is in range B (91.5%); groups of C, D and E comprise 6.5%. 1.8% of published tweets are in accounts that have more than 10 million followers being the greatest number of followers (in the moment of this study) the CNN account with 23.713.868 (@CNN). Potentially, the impact of tweets published has been significant and the greater number of tweets about Super Tuesday was generated from accounts that, summing its followers, have a potential impact superior to the single tweet published by @CNN; of course, we are not evaluating qualitative elements of these messages and other variables that can influence in their visualization by followers. However, regarding the quantitative aspect, Twitter gathers around specific accounts, a considerable number of users willing to read contents published in them. Regarding following, the number of accounts followed (as per the accounts that have published the tweets in the sample) is less compared to the Twitter accounts that follow them (see table 8). Range B encompasses most of the percentage of accounts of the sample (83.2%). The account with a higher number of following in the sample is @HRC with 200.979 following and belongs to Human Rights Campaign. a) starts about 9:00 in the morning (activity onset in polling booths); b) the most active schedule is published from 17:00 hours; c) from this time, votes are more advanced and the closure of electoral booths begins; d) 28.7% of tweets are recorded from 17:00 hours up to 23:00 hours. The review of frequency of publication distributed by hours indicates there were three more active time slots: a) the first, of the Super Tuesday event, was between 7:00 and 7:59 with 8.8% of published tweets; b) the second, between 9:00 and 9:59 with 10.7% of published tweets; c) the third, and more active of the three, between 17:00 and 17:59 with 11.9% of tweets published. The first two correspond to the moments of electoral booths opening; the last, coincides with the last stage of the event and the beginning of electoral booths closure. Graph 2. Distribution of the frequency of tweets publication by time slot. Source: Authors’ own creation. Results show: a) that the first hours of Super Tuesday the protagonist in Twitter were personal accounts and they were active during the complete event, taking the first places in publication in several time slots; b) mass media accounts had a leading role towards the end of the event; specifically, from 17:00 hours and when electoral booths were starting to close and the first data was known; c) accounts linked to politics were in a second, and even, a third plane during the day, being the moment of opening and closing the moments with more presence in Twitter. The use of hyperlinks un tweets was frequent (81.5%) enabling the interactivity with other online contents. These tweets (n = 457) included a total of 551 hyperlinks: 79.4% included one and 20.6% two. The frequency of hyperlinks to images (54.7%) outstands without discarding the relevance to other multimedia elements or even other tweets that keep publishing during the day; there outstand the interest of hyperlinks to journalistic articles. It was of interest knowing the use of images as element in the construction of contents of tweets. Results indicate that 56.7% of tweets from the total sample (N = 561) have images. The graphic composition is the type of image used most (26.9%) followed closely by photograph (24.1%) without text; photograph where text was included occupied third place (8.9%). The resource of image reinforced the contents of tweets and most of senders preferred images endorsing its relevance in Twitter contents (see table 9). On the other hand, the informative load of images constituted themselves, a scope of themes that had an intentionality (see table 10). Regarding the theme of image, the presence of Donald Trump had preference (25.7%) followed by Bernie Sanders (19.2%); Hillary Clinton occupied the fifth place (7.2%) of tweets that incorporated her image. The SuperTuesday theme was third and through these images the moments of the event were reflected (11.2%). Note. From the general sample, the tweets that didn’t have images were discarded from this table (245 tweets) as well as the tweets that had images but referenced other themes (40 tweets). Source: authors’ own creation. A first approach, from the followers and followings perspective (see table 11), and how they structured tweets, allows visualizing the characteristics of participation of users and identify an approach towards potential influencers in Twitter regarding Super Tuesday. It is worth mentioning the supremacy “mass media” have on the accounts with more followers. However, we must outstand the (personal) account of @Tip belonging to the rapper Clifford Joseph Harris from the City of Atlanta, Georgia, United States (http://www.tipaperwork.com/). In the accounts with more followings no social mass media had a determinant weight. They are distributed among the accounts of third sector organizations, politics and personal. @HRC outstands as first account belonging to the Human Rights Campaign, an organization founded in 1980 and which entails one of the organizations that leads mobilization in favour of lesbian, gays, bisexual and transgender communities in the United States. Table 11. Comparison of the top 10 accounts with a greater number of followers and following and characteristics of their profile. The use of hashtag and mentions (see table 12) entails the decision of interacting, participating and generating interactivity on Twitter. The use of hashtags reflects the interest that tweets published could be recovered, visualized and related with a specific theme. The presence of a hashtag is guaranteed by the way the sample was constituted (all tweets have #SuperTuesday); however, the number of additional hashtags represents the interest of the user by other themes and which were related to Super Tuesday. Regarding mentions, there is a premeditated intention of generating attention by the mentioned party and try interaction: being that the interest party identifies the message, that it interacts with the message where it has been mentioned (retweets or favourite) or that it responds to the message establishing a conversation. The number of tweets with at least one mention was less (n = 173); but, we must consider that 90.1% of tweets incorporated between one and two mentions. The characteristics of contents is an indicator of the approach offered by tweets created in Super Tuesday. In tweets (N = 561) “original contents” were preferred (76.6%), in second place, tweets of “journalistic nature” (13%); those who used quotes 6.1% and, abbreviated, which were less frequent (4.3%). However, regarding the theme, the categories were focused on republican candidates, democrat candidates and the Super Tuesday event. In the general sample (N = 561) the greater frequency of tweets published contents about Super Tuesday (31.9%) and in which there any of the candidates highlighted – neither in the text, hyperlinks, mentions or images- (see table 13). The republican candidate Donald Trump occupied the second place with 24.6% of tweets published followed by Bernie Sanders with 15.7%; Hillary Clinton, got the sixth place with 5.3 % of tweets published. If we take Super Tuesday tweets as a reference (n = 421) the distribution, in general, keeps steady; it is outstanding that Hillary Clinton occupies then the fourth place. 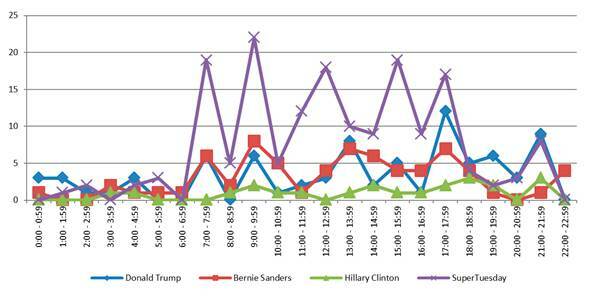 In either case, Super Tuesday was the preferred theme in tweets during the day, making place at the end, to candidates as preferred theme (see graph 3). The preference themes vary according to the account profile (see table 14). Results indicate that from the mass media and personal profiles the preference was focused on the Super Tuesday event; except accounts related with politics, including political parties, which set aside the Super, which set the voting theme aside to the fourth position: the preference for them was the publication of contents related to candidates. The subthemes nuance the main subject (see table 15); although, the subtheme with a higher frequency was the electoral day in all accounts categories. However, other subthemes emerged and, among them, the theme about immigration, financing of electoral campaign and economic crisis were preferred. Note. The other categories of accounts, which obtained a lesser percentage of published tweets, kept the Super Tuesday as main theme. In the case of the accounts of “Independent projects / Blog” results were (n = 46): Super Tuesday (50.0 %), Donald Trump (13.0 %); Bernie Sanders (13.0 %); Republican Party (8.7 %); Ted Cruz (6.5 %); Hillary Clinton (4.3 %); Bill Clinton (2.2 %); Mitt Romney (2.2 %). The category “Companies”, with four tweets published, whereas 100 % was about Super Tuesday. The same occurred with the categories of the accounts “Governmental / Public” from where just a single tweet was published and it was about Super Tuesday. A category that was differenced, was the category of accounts belonging to the “Third sector / NGO” which were (n = 14): Bernie Sanders (64.3 %), Super Tuesday (5.0 %). Source: authors’ own creation. electoral process with a high mediatic component. Donald Trumps is the candidate to whom there is more reference on tweets and with a positioning in his favour. The result of Bernie Sanders is similar, in whom there is a high percentage of acceptance. On the other extreme, there is Hillary Clinton who, even though there are only 30 tweets where there is a concrete positioning, she gets the greatest percentage of positioning against her. Data analysed are limited to tweets published in the Super Tuesday event and which were recovered using the #SuperTuesday hashtag. It is the first research we are developing about the use of Twitter in the electoral campaign of the United States. However, we consider it provides data of interest as to value the use of Twitter as a public space where citizens manifest their political positions and a tool in the political communication of candidates with voters. Regarding the characteristics of tweets published during Super Tuesday (a greater percentage published in the accounts of United States and Great Britain), we identified the relevance of some Twitter accounts that constituted the source of the greater number of tweets; assuming the relevance these accounts have in the mobilization and participation of other Twitter users. These accounts belonged to a personal profile and a profile linked with the political sector: voters and candidates marked the dynamics of the day; specially, during the first hours and previous knowing the results. There is interest to identify influencers who, predictably, were stablishing the thematic agenda in social networks in the following days. It was understandable that mass media had an active role in the generation of contexts and interaction on social networks due to the transcendence of the event and with preference after closing polling booths. Different from personal and political parties accounts, the potential impact of Twitter accounts on mass media, turns them into a significant diffusion source for millions of its followers. The interest of this study towards Donald Trump and Hillary Clinton was grounded on the fact that they were the candidates elected by political parties for the Presidency of the United States. However, in the analysis other candidates were not discarded. Data reflected, at least during Super Tuesday (March 1, 2016), the supremacy of Donald Trump in the Republican Party with the favouring positioning of tweets with greater impact that, even though they could be biased because there was a percentage of tweets coming from his political party, there was no doubt that retweets and favourites indicated a favourable engagement. A different situation occurred with the candidates for the Democratic Party, Bernie Sanders was the candidate with greater impact and relevance on that day leaving the candidate Hillary Clinton far behind, whom besides had a more negative positioning. This comparative aspect between candidates minimizes the bias that predictably could be indicated about the relevance of profiles in accounts. In either case, other data confirmed this positioning: themes of images and of tweets coincided in granting relevance to Donald Trump and Bernie Sanders leaving Hillary Clinton at a considerable distance. Finally, what was the usage of Twitter by users during Super Tuesday? The constant was the preference for highlighting the electoral day through original contents, in the theme and subthemes. In the general sample (N = 561) the greatest frequency of tweets (including images) published contents about Super Tuesday (31.9%) and where none of the candidates outstood -neither the text, hyperlinks, mentions, hashtag or images-. Super Tuesday was the preferred theme in tweets during the event making place, at the end of the day, to candidates as preferred theme. There was interest to visualize the #SuperTuesday hashtag and stablish the interactivity between Twitter users. Results indicate that in personal profiles, preference was focused on the Super Tuesday event. In Spain, the time zone before summer is UTC +1 throughout the territory, except Canary Islands, which is UTC. In the United States, there coexist five time zones and we have considered convenient to take the Central Standard Time (CST) as reference: UTC-6. Compared to Spain, in the United States, there are 6 hours less. Ahmed, S., Jaidka, K., y Cho, J. (2016): “The 2014 Indian elections on Twitter: A comparison of campaign strategies of political parties”. Telematics y Informatics, 33(4), 1071-1087. Anguiano, C. (2016): “Hostility and Hispandering in 2016: The Demographic and Discursive Power of Latinx Voters”. Women's Studies in Communication, 39(4), 366-369. Becker, R., Amundson, N., Anderson, D., Wenzel, K., Yakubova, M., Sajaia, N., y Frannea, R. (2009): “Political Participation, Efficacy and the 2008 Minnesota Presidential Caucuses”. Qualitative Research Reports in Communication, 10(1), 38-45. Bimber, B. A. (2003): "Campaigning Online : The Internet in U.S. Elections. Oxford: Oxford University Press. Blanco, M., y R. Sueiro (2014): Cómo conseguir 10.000 seguidores en Twitter. Madrid: ESIC. Bosch, T. (2017): “Twitter activism and youth in South Africa: the case of #RhodesMustFall”. Information, Communication y Society, 20(2), 221-232. Bugh, G. (2010): Electoral College Reform : Challenges and Possibilities. Farnham, Surrey, England: Routledge. Bruns, A., y J. Burgess (2012): ‘‘Researching news discussion on Twitter. New methodologies’’, Journalism Studies, 13(5-6), 801–814. doi: 10.1080/1461670x.2012.664428. Burgess, J., y A. Bruns (2012): ‘‘(Not) the Twitter election: The dynamics of the # ausvotes conversation in relation to the Australian media ecology’’, Journalism Practice, 6(3), 1–40. doi:10.1080/17512786.2012.663610. Caleffi, P. M. (2015): ‘‘The ‘Hashtag’: A New Word or a New Rule?’’ Journal of Theoretical Linguistics, 13(2): 46–69. Carew, J. (2014): “Online Environmental Activism in South Africa: A Case Study of the #IAM4RHINOS Twitter Campaign”. Global Media Journal, 8(2), 207-230. Cozma, Raluca, and Kuan-ju Chen. (2013): ‘‘What’s in a Tweet? Foreign Correspondents’ Use of Social Media’’ Journalism Practice, 7(1), 33–46. doi:10.1080/17512786.2012.683340. Denton, R. E. (2002): The 2000 Presidential Campaign: A Communication Perspective. Westport, CT: Praeger. González, C. (2010): “Mobilizing Information in Univision Online's Election 2008 Forum”. International Communication Association. Communication y Mass Media Complete. Graham, T., Jackson, D., y Broersma, M. (2016): “New platform, old habits? Candidates’ use of Twitter during the 2010 British and Dutch general election campaigns”. New Media y Society, 18(5), 765-783. Gunn, E. (2017): “Twitter as arena for the authentic outsider: exploring the social media campaigns of Trump and Clinton in the 2016 US presidential election”. European Journal of Communication, 32(1), 50-61. Guo, L., y Vargo, C. (2015): “The Power of Message Networks: A Big-Data Analysis of the Network Agenda Setting Model and Issue Ownership”. Mass Communication and Society(18), 557–576. Gurian, P. (1993): “The distribution of news coverage in presidential primaries”. Journalism Quarterly, 70(2), 336-344. Gutsche, T., Kapteyn, A., Meijer, E., y Weerman, B. (2014): “The RAND Continuous 2012 Presidential Election Poll”. Public Opinion Quarterly, 78(Special Issue), 233-254. Harmon, M. D. (2004): “Casting the 2000 U.S. Presidential Primaries”. Atlantic Journal Of Communication, 12(2), 93-104. Hogan, J. M. (2016): “George Wallace, speech at serb hall (26 March 1976)”. Voices Of Democracy, (11), 66-105. Hunter, K. M., Lewis, J., y Overton, J. E. (2013): “My Eyes Adored You: A Content Analysis of Newsmagazine Cover Images in the 2008 U.S. Presidential Election Campaign”. Ohio Communication Journal, 51, 277-301. Igartua Perosanz, J. J. (2006): Métodos cuantitativos de investigación en comunicación. Barcelona: Editorial Bosch. Jungherr, A., y Schoen, H. (2016): “The Mediation of Politics through Twitter: An Analysis of Messages posted during the Campaign for the German Federal Election 2013”. Journal of Computer-Mediated Communication, (21), 50–68. Kelly Garrett, R. (2011): “Troubling Consequences of Online Political Rumoring”. Human Communication Research(37), 255–274. Kennamer, J. D. (1995): “Las campañas electorales en los Estados Unidos, la prensa y las encuestas”. Estudios, (5), 75-84. Klar, S. (2014): “A Multidimensional Study of Ideological Preferences and Priorities among the American Public”. Public Opinion Quarterly, 78(Special Issue), 344-359. Larsson, A. O., y Ihlen, Ø. (2015): “Birds of a feather flock together? Party leaders on Twitter during the 2013 Norwegian elections”. European Journal of Communication, 30(6), 666-681. Lee, J., y Lim, Y.-s. (2016): “Gendered campaign tweets: The cases of Hillary Clinton and Donald Trump”. Public Relations Review, 42(5), 849-855. Lemke, J., y Chala, E. (2016): “Tweeting democracy: An ethnographic content analysis of social media use in the differing politics of Senegal and Ethiopia’s newspapers”. Journal of African Media Studies, 8(2), 167–185. López-García, G. (2016): “'New' vs 'old' leaderships: the campaign of Spanish general elections 2015 on Twitter”. Communication y Society, 29(3), 149-168. López-Hermida, A., y Fernanda Vallejo, M. (2016): “Estereotipo femenino en 140 caracteres. Aproximación a la campaña de Hillary Clinton en Twitter”. Revista de comunicación, (15), 48-69. Macnamara, J., y Kenning, G. (2014): “E-electioneering 2007-13: trends in online political campaigns over three elections”. Media International Australia, (152), 57-74. Martínez-Rolán, X., y Piñeiro-Otero, T. (2016): “The use of memes in the discourse of political parties on Twitter: analysing the 2015 state of the nation debate”. Communication y Society, 29(1), 145-159. Marcos-García, S. (2017): “El empleo de Twitter como herramienta estratégica de comunicación. Análisis del caso Podemos”. Communico, (3), 1-27. McAlister, J. F. (2016): “Making Feminist, Queer, Latinx, and #BlackVotesMatter”. Women's Studies In Communication, 39(4), 353-356. McKinnon, M., Semmens, D., Moon, B., Amarasekara, I., y Bolliet, L. (2016): “Science, Twitter and election campaigns: tracking #auspol in the Australian federal elections”. JCOM: Journal of Science Communication, 15(6), 1-22. Meso Ayerd, K., Larrondo Ureta, A., Rivero Santamarina, D., y Agirreazkuenaga Onaindia, I. (2016): “Uso e impacto de Twitter en la comunicación política. El caso vasco”. En J. M. Rodríguez Rodríguez, Retroperiodismo, o el retorno a los principios de la profesión periodística (pp. 161-177). Madrid: Sociedad Española de Periodística. Murthy, D. (2015): “Twitter and elections: are tweets, predictive, reactive, or a form of buzz?” Information, Communication y Society, 18(7), 816-831. Narbona, J. (2016): “Digital leadership, Twitter and Pope Francis”. Church, Communication and Culture(1), 90-109,. Ott, B. L. (2017): “The age of Twitter: Donald J. Trump and the politics of debasement”. Critical Studies in Media Communication, 34(1), 59-68. Papacharissi, Z., y M. de Fatima Oliveira. (2012): ‘‘Affective News and Networked Publics: The Rhythms of News Storytelling on #Egypt’’, Journal of Communication 62(2), 266–282. http:// doi.org/10.1111/j.1460-2466.2012.01630.x. Penney, J. (2016): “Motivations for participating in ‘viral politics’. A qualitative case study of Twitter users and the 2012 US presidential election”. Convergence: The Journal of Research into New Media Technologies, 22(1), 71-87. Peña-Jiménez, P. (2011): “El spot electoral negativo”. Revista Latina de Comunicación Social, (66), 399-425. Pérez González, J. (2015): “El uso de Twitter como herramienta de comunicación política durante la campaña para las elecciones europeas de 2014: estudio de caso del @PPopular”. Communico, (1), 38-58. Pérez-Martínez, V. M. (2009): “Multimedialidad e interactividad en la cobertura informativa de las elecciones presidenciales de los Estados Unidos de 2008 en los cibermedios españoles”. Revista Latina de Comunicación Social, (64), 161-174. Powell, K. (2016): “‘The Year of the Ballot or the Bullet’: A Discussion of Race, Revolution, and the 2016 Election”. Women's Studies in Communication, 39(4), 370-374. Prior, M. (2012): “Who watches presidential debates? Measurement problems in campaign efects research”. Public Opinion Quarterly, 76(2), 350-363. Puyosa, I. (2016): “¿Contrahegemonía? Comportamiento de medios digitales y Twitter durante el proceso de las elecciones parlamentarias de diciembre 2015”. Comunicación, (173), 100-111. 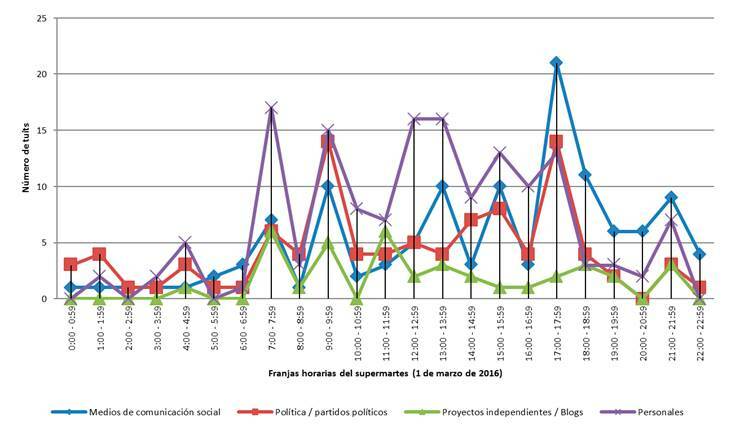 Quevedo Redondo, R., Portalés-Oliva, M., y Berrocal Gonzalo, S. (2016): “The image use on Twitter during the 2015 municipal election campaign in Spain”. Revista Latina de Comunicación Social, (71), 85-107. Ruiz, A. C. (2012): “Debates electorales en televisónnuevos contenidos para nuevos formatos”. III Congrés Internacional Associació Espanyola d'Investigació de la Comunicació. Tarragona: Universitat Rovira i Virgili. Ruthizer, T., Koestler, M., Dunn, M., y Barlekamp, J. (2017): “The Potential Impact of the U.S. Presidential Election on Business Immigration”. Employee Relations Law Journal Spring, 42(4). Sabato, L. J. (2002): Overtime: The Election of 2000 Thriller (Vol. 3). New York: Longman. Serfaty, V. (2012): “E-The Peoplea Comparative Perspective on the Use of Social Networksin U.S. and French Electoral Campaigns”. Comunicação Midiática, 7(3), 195-214. Smidt, C. D. (2014): “Dynamics in Partisanship during American Presidential Campaigns”. Public Opinion Quarterly, 78(Special Issue), 303–329. Tewksbury, D. (2006): “Exposure to the Newer Media in a Presidential Primary Campaign”. Political Communication, 23(3), 313-332. Theocharis, Y., Barberá, P., Fazekas, Z., Popa, S. A., y Parnet, O. (2016): “A Bad Workman Blames His Tweets: The Consequences of Citizens' Uncivil Twitter Use When Interacting With Party Candidates”. Journal of Communication, 66(6), 1007-1031. Valdez Zepeda, A., y Huerta Franco, D. A. (2009): “Estrategias de comunicación en campañas electoralesel caso de la contienda presidencial de Estados Unidos 2008”. Contratexto, (17), 21-32. Vargo, C. J., Guo, L., McCombs, M., y Shaw, D. L. (2014): “Network Issue Agendas on Twitter During the 2012 U.S. Presidential Election”. Journal of Communication, (64), 296-314. Weeks, B., y Southwell, B. (2010): “The Symbiosis of News Coverage and Aggregate Online Search Behavior: Obama, Rumors, and Presidential Politics”. Mass Communication and Society, (13), 341–360. Wells, C., Shah, D. V., Pevehouse, J. C., Yang, J., Pelled, A., Boehm, F., . . . Schmidt, J. L. (2016): “How Trump Drove Coverage to the Nomination: Hybrid Media Campaigning”. Political Communication, 33(4), 669-676. Wilz, K. (2016): “Bernie Bros and Woman Cards: Rhetorics of Sexism, Misogyny, and Constructed Masculinity in the 2016 Election”. Women's Studies in Communication, 39(4), 357-360. Winneg, K. M. (2011): “Testing the Mobilization and Reinforcement Hypothesis and Predictors of Voting in the 2008 U.S. Presidential Election”. Annual Conference of the International Communication Association (pp. 1-34). Boston: Communication y Mass Media Complete. Article received on 19 on April 2017. Accepted on 2 June. Published on 22 June 2017.